The WCF WEB HTTP Programming Model allows developers to expose Windows Communication Foundation (WCF) Web services through basic HTTP requests without requiring SOAP. The WCF WEB HTTP Programming Model is built on top of the existing WCF extensibility model. Using this article I’m going to explain how to create a REST enabled WCF Service. I have used a simple Patient Sevice to demonstrate the RESFful WCF Service. WCF is the Microsoft framework for building applications that communicates over a network, regardless of the style or protocol. The WCF Services has the ability to expose REST services using System.ServiceModel.Web assembly. This ServiceModel gives you two attributes, WebGetAttribute and WebInvokeAttribute and a URI template mechanism that enables you to declare the URI and verb to which each method is going to respond. 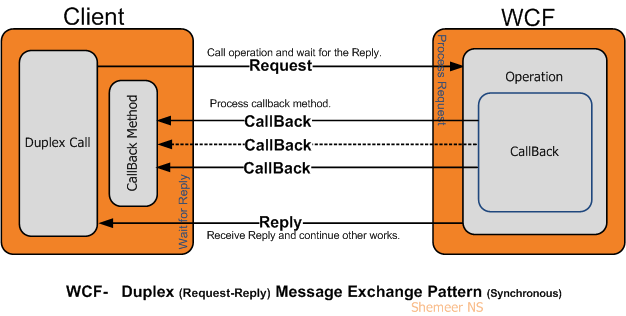 Message Exchange Pattern describes how the client and server should exchange messages, and also the MEP will make clear that the client is going to wait for any response from the service or just simply sending is enough ,or the client is expecting any callbacks from the service. 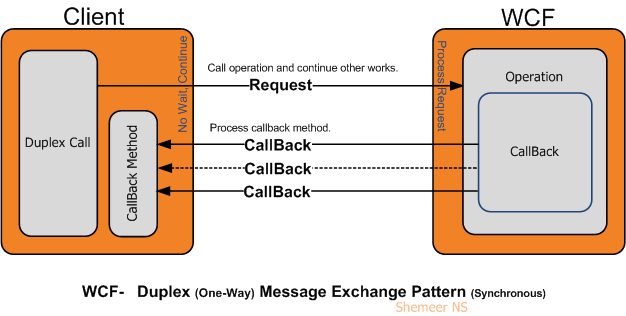 WCF supports three Message Exchange Patterns (MEPs). They are as follows. The below given diagram show how Duplex (One-Way) works. The IErrorHandler type exposes two methods. HandleError and ProvideFault. Use the HandleError method to implement error-related behaviors such as error logging, system notifications, shutting down the application, and so on, and return a value that specifies whether the exception has been handled appropriate. 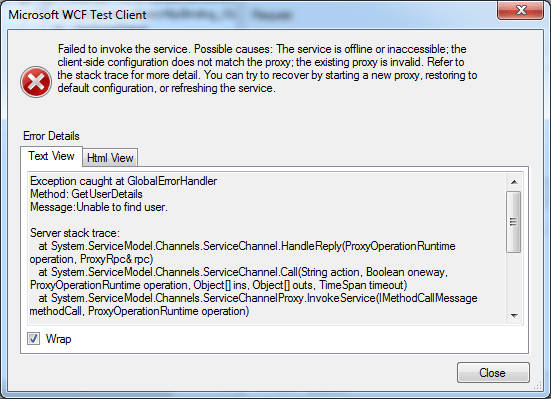 ProvideFault enables the creation of a custom FaultException<TDetail> that is returned to to the client from an exception in the course of a service method. The IServiceBehavior type exposes three methods. AddBindingParameters, ApplyDispatchBehavior and Validate. For this article we are much interested only in ApplyDispatchBehavior method. Here AddBindingParameters provides the ability to pass custom data to binding elements to support the contract implementation. ApplyDispatchBehavior provides the ability to change run-time property values or insert custom extension objects such as error handlers, message or parameter interceptors, security extensions, and other custom extension objects. Use the Validate method to confirm whether the current service can execute properly according to your scenario. Whenever an unhandled exception occurs in a service decorated with the service behaviour attribute, two methods on the global error handler are called automatically: ProvideFault which allows you to construct a FaultException (rather than let ServiceModel do it), and HandleError which is intended for logging. The ProvideFault method is called first on the worker thread that is invoking the service call and HandlerError is called asynchronously on a separate thread, so lengthy logging operations don’t block the service request thread from sending a FaultException back to the client immediately.